You no doubt have visited a suburban landscape complete with a sprawling, blue-topped IKEA store, which is a completely natural sight by now. But an IKEA in the middle of a crowded, busy, city with its more expensive real estate? Weird. And it’s happening. IKEA announced plans back in 2012 to build its very own district in Hamburg, Germany, and its recently opened, first-ever city-center store there appears to be a first step in that direction, reports Businessweek. The new store is in the district of Altona, and is part of a pilot project to see if it can grab the business of citydwellers who either can’t easily or don’t want to visit the suburbs or outer reaches to get to an IKEA. 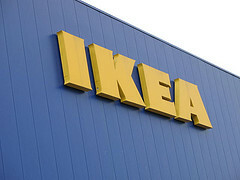 IKEA expects about 4,000 customers to stream through the doors on average on weekdays and twice that on the weekends and peak days. Bigger sites get as many as 12,000 per day in Munich and Berlin. “There are many city-dwellers who don’t have a car or aren’t willing to drive outside the city to do their shopping,” said Ferber, bringing up a pretty common problem for many city folk. To help those who don’t take public transport or own a bike, IKEA says it will rent out cargo bikes for customers to borrow — free of charge — as long as they bring them back within three hours of hauling their stuff home. Bike couriers will also be available for hire. “It’s a big challenge for us as we needed a good traffic and service concept to get products to clients’ homes within a short period of time,” Ferber said. Because there’s nothing like trying to carry long boxes held together by string on a crowded bus filled with other people trying to carry long boxes held together by string.